When it’s cold outside there’s no meal more comforting than beef stew a this java beef stew is always a hit! Well it was definitely cold outside today, and the snow was coming down heavily. A perfect day for the slow cooker to do all the work with just a few minutes of prep on my part. I love making stew for dinner because it’s so easy to adapt, making it easy to use what you have on hand. This meal is satisfying and delicious and smells amazing when you walk in the door from a tough day. If you haven’t heard of adding coffee to beef dishes, you are missing out. It’s a great addition and doesn’t make your end result taste like coffee. Keep in mind, since this is cooked in a slow cooker you don’t use a lot of liquid. The cooking process will develop liquid of its own. RELATED: Love your slow cooker as much as I do? Try my crockpot macaroni & cheese! If you were to make this in a Dutch oven for example, you would increase the coffee and the broth considerably. 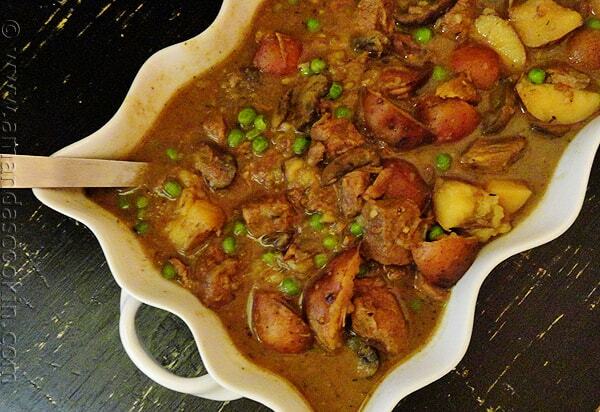 This is one of my favorite stew recipes, I make it all the time! It’s great for those nights when you won’t be home until after soccer practice, dance recitals and dental appointments. 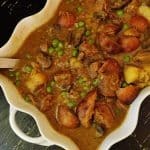 I don’t have an Instant Pot, but if if I did I’d be trying this Instant Pot Beef Stew. 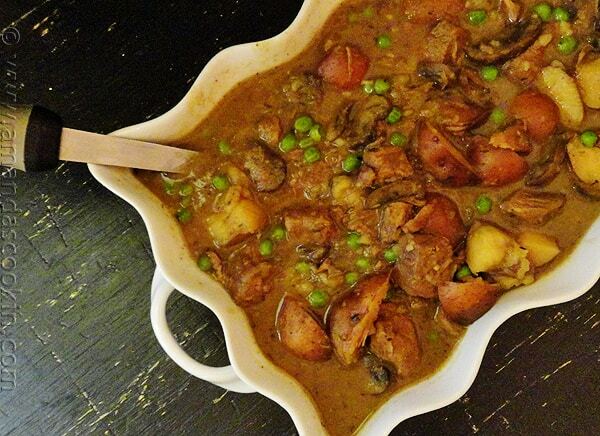 Pair this stew with my pull apart dinner rolls and you have a satisfying meal for your family. Dry the beef stew meat using paper towels. Dredge the beef in the flour and brown in a large skillet in one tablespoon of the olive oil. When browned, empty the meat into the slow cooker. Add the potatoes and toss with the beef. Sprinkle potatoes and beef with the thyme and season with salt and pepper. Do not clean the skillet. There will probably be some brown bits in the pan and that’s good! Add the remaining tablespoon of olive oil and saute the slivered onions and sliced mushrooms until the begin to get tender. Add the garlic and saute for a minute longer. Transfer the onion mixture to the slow cooker. Put the skillet back onto the stove and add the broth and coffee. Use a spatula to deglaze the pan getting all those yummy brown bits mixed into the broth mixture. Simmer for a few minutes just to get it all mixed together, then add the broth mixture to the slow cooker. I made this last night put slow cooker on high for five hours it came out delicious. The coffee really adds to the flavor. Awesome, so glad you enjoyed it Heather! Brewed coffee. I will make that distinction in the ingredient list to avoid confusion. Thanks! Thanks. Is the coffee a mixture of coffee and water or just coffee on it’s own? Would plain chocolate work as an alternative? Hi Ian, just coffee on its own. There isn’t very much because its a crock pot recipe I’m not sure about the chocolate, maybe just sub beef broth, or you can use instant coffee mixed with water or decaf. At what stage do you add the baby reds? This is something my whole family would LOVE! And, of course! Coffee! I use a coffee rub, so why not in a beef stew? Fabulous idea! I just saw a pot roast recipe that had a coffee glaze, so this must be the thing to do. I have some baby onions too and was planning to make a stew, so I’m going to use your idea of the coffee in the broth. Can’t wait! It looks great. I just got that baby reds is potatoes. Duh. I have pearl onions but thought you just had another name for them. haha! I really need to try adding coffee to some beef. A friend of mine just made a coffee rubbed flank steak too. I’m surprised that you only put in 1/4 of a cup, I guess that way there is only a hint of flavor…. Loved this recipe, Amanda! I’ve added coffee to stews, and also used coffee (ground) as a dry rub for a pork tenderloin that is to die for! I’d never have thought to add coffee to a beef stew so really intrigued about how it will taste. I’m going to bookmark it. This recipe sounds yummy. I just pinned it to my Pinterest board!